Only a few dentist in the United States routinely practice laser dentistry owing to the high cost of the equipment and the skills required to use it. Dr. Stankov is using this phenomenal, tool in many procedures. It enables him to create comfortable and beautiful teeth without more invasive restorations. The Waterlase laser uses the Hydrokinetic process that gently washes away hard tissues including tooth enamel with a spray of laser-energized water droplets. There is no vibration, transfer of heat or cracking of tooth structure, which are the primary causes of pain and post-operative sensitivity associated with the conventional drill. 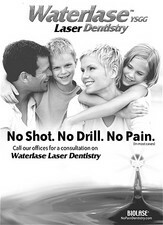 The Waterlase laser is virtually painless in most cases.